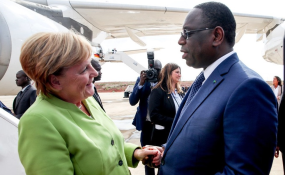 The Nigerian Envoy to Germany, Ambassador Yusuf Tuggar has listed economic and security issues to top agenda during the German Chancellor Angela Merkel's visit to Nigeria, today. Tuggar said this during a press briefing to herald the visit of the German Chancellor Chancellor, Angela Merkel. He explained that the leader of the European economic powerhouse, Germany, would have on her entourage, German business delegation. This move, he said, is to provide veritable opportunities for small business owners from both Nigeria and Germany to interface for mutual benefits. "One of the challenges we have faced over the years in the area of small and medium scale business is how to attract small scale businesses from Germany to our country. "This is in line with the Economic Growth and Recovery Plan of the federal government. At the moment, the German government is also doing everything to push out their small and medium scale businesses to take their place in an increasingly globalized world." The envoy also revealed that, some businessmen on Merkel's entourage are to sign Memorandum of Understanding with some Nigerian companies. "Nigeria wants to take advantage of the areas Germany has comparative advantage. "Some German companies are interested in Nigerian Agriculture sector through NIRSL. This is about how to strengthen our agricultural sector to create prosperity for Nigerians, especially, for young people." Other issues that may receive attention during Merkel's visit is security. According to Tuggar, Nigeria and Germany have been collaborating on security for a while now. He said, "As the Internally Displaced Persons (IDPs) are beginning to settle back to where they were displaced, huge funds is required. Nigeria cannot do it alone; the support of the global community is needed to successfully resettle them. "After this visit, Oslo '2' will follow. This is about how to mobilize global support for rehabilitation process in the Nigerian North East." The diplomat also gave a startling revelation of how nationals of other countries fake Nigerian. He disclosed that in 2017, 26 per cent of those claiming to be Nigerians in Germany are not. "In 2017, 26 per cent of those claiming to be Nigerians were found to be not. In 2018, about 14 per cent were discovered to be faking Nigerian. "This development portends great challenge for us. This is happening because of our large population."